Recipe from Robert Lack, Buyer, Dry Grocery, Wal-Mart. A great and healthy way to start your day is with a delicious, veggie-filled egg white omelet. Substitute your favorite seasonal vegetables and try different low-fat cheeses for flavor. Lightly sauté veggies in olive oil. Coat omelet pan with cooking spray and heat. Whisk egg whites until frothy and pour into hot pan. 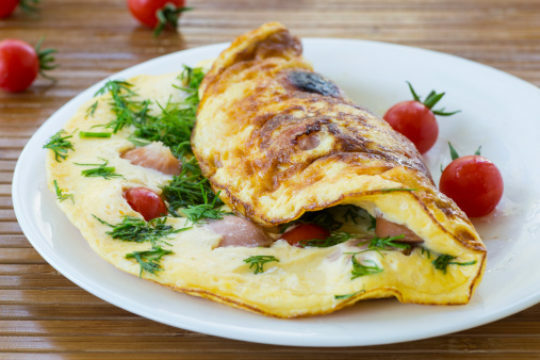 Loosen the sides of the omelet – when the whites have partially firmed, carefully turn it over and cook the other side. Place veggies and cheese, if desired, in the center of the omelet. Fold the omelet over the vegetables. Garnish with additional herbs and cheese. Each recipe makes 2 servings. Baker’s Tip: You can also use cholesterol-free egg substitute in place of egg whites. Cook according to directions.